Fellaini has impressed for Man United this season. MAROUANE FELLAINI SAYS he would break bones for Jose Mourinho after emerging as a key figure at Manchester United. The Belgium international has not always seen his skill set embraced at Old Trafford since completing a £27.5 million move from Everton in 2013. He has often being accused of embodying what United became in the wake of Sir Alex Ferguson’s departure, with the club seen to have deserted their footballing roots. 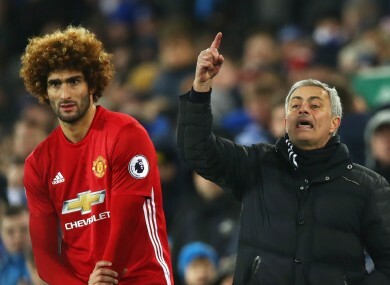 Fellaini has, however, taken on an important role under Mourinho in 2016-17 and is grateful to the Portuguese coach for having restored confidence in his ability both from himself and those in the stands. The 29-year-old, who made 47 appearances in all competitions this season, told hln.be: “When I feel that people trust me, I’m prepared to do everything. Fellaini will form part of Mourinho’s plans once again in 2017-18, having seen a 12-month extension option in his contract triggered. He is, however, looking past that point and hopes fresh terms will be tabled at some stage which allow him to further extend his time with the Red Devils. Now I am here at Manchester United, I’m in and want to stay here,” Fellaini added. Fellaini figured in all three of United’s 2016-17 trophy triumphs, with the Belgian gracing the Community Shield, EFL Cup final and Europa League final. Email “Fellaini prepared to suffer broken bones for Mourinho”. Feedback on “Fellaini prepared to suffer broken bones for Mourinho”.